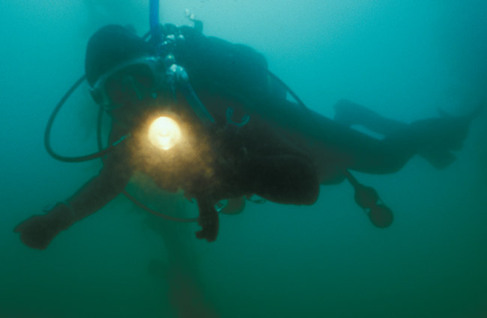 A diver enters the "gut" leading to the cave at Long Cave. The wall on the right rises to within about 4 feet of the surface. In surgy conditions, it's great fun to sit next to the wall at about 10 feet depth, and let a wave lift you up, over the wall, and down on the other side. The wall on the right rises to the surface and 50 feet up a cliff above. Here I am jumping in off the dive boat El Tigre, at Middle Arch at the Tawiti Rahi, the northernmost of the Poor Knights Islands. One Canadian had a GoPro video camera and used it to record the sights, at El Morro. 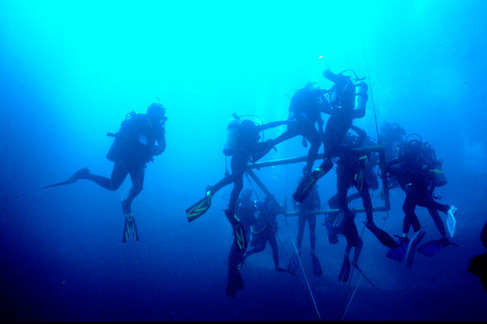 Divers confer amidst a school of bigeye trevally jacks at El Morro, off Cabo Pulmo, Baja. These divers were from Canada and I will always think of them as the Canadian divers. 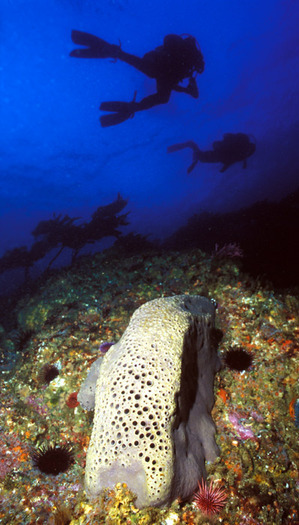 Two divers swim past a moon sponge, on the North side of Santa Cruz. Swimming into a stiff current isn't much fun, and if the scenery is boring it may not be very entertaining either. Sometimes dive training gets a little serious in the Blue Hole, as divers do fin pivots on squares of PVC pipe suspended at 40 ft, or practice compass navigation within the confines of the sinkhole. 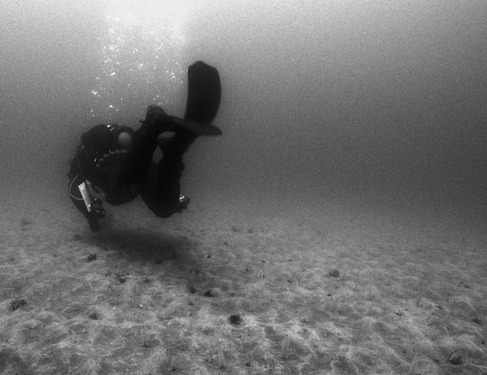 Diver in low visibility. A light can help, although it can also simply illuminate whatever is blocking the view to begin with.